The Station today is at Sts. John And Paul. The stational Mass was on the Caelian Hill, in the Basilica of Bizante, erected by that senator and his son Pammachius within the house of SS. John and Paul. The two martyrs had suffered death on this spot for the faith, and had been secretly buried in a crypt. 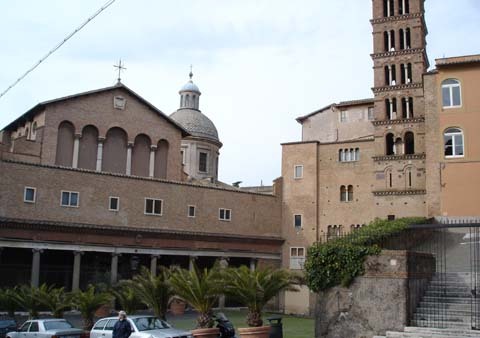 They were thus the only Roman martyrs buried in the very heart of the Eternal City. The Mass sets forth the emptiness of external ceremonies where these are not accompanied by an internal spirit of true repentance. The Gospel sets forth the Christian law of love and good-will toward our neighbor. To return the courtesy of others with equal grace is a rule of good manners that even pagans may practice, but in order to be able to pardon injuries, to do good without hope of return, we need the example of Christian love as Christ has set it down and to love Him as He loves the Father. May Thy kindly favor, we beseech Thee, O Lord, accompany the fast we have begun, that we may be able to practise with a single heart the observance which we bodily perform. Through Jesus Christ our Lord, Who liveth and reigneth with Thee in the unity of the Holy Ghost, one God Forever and ever. R.Amen. O almighty and eternal God, who hast dominion over both the living and the dead, and hast mercy on all whom Thou foreknowest shall be Thine by faith and good works : we humbly beseech Thee that all for whom we have resolved to make supplication whether the present world still holds them in the flesh or the world to come has already received them out of the body, may, through the intercession of all Thy saints, obtain of Thy goodness and clemency pardon for all their sins. Through our Lord Jesus Christ, Who livest and reignest, with God the Father, in the unity of the Holy Ghost, one God For ever and ever. R. Amen. Lesson from Isaias the Prophet. Thus saith the Lord God: Cry, cease not, lift up thy voice like a trumpet, and show My people their wicked doings, and the house of Jacob their sins. For they seek Me from day to day, and desire to know My ways, as a nation that hath done justice, and hath not forsaken the judgment of their God: they ask of Me the judgments of justice: they are willing to approach to God. Why have we fasted, and Thou hast not regarded: have we humbled our souls, and Thou hast not taken notice? Behold in the day of your fast your own will is found, and you exact of all your debtors. Behold you fast for debates and strife, and strike with the fist wickedly. Do not fast as you have done until this day to make your cry to be heard on high. Is this such a fast as I have chosen: for a man to afflict his soul for a day? Is this it, to wind his head about like a circle, and to spread sackcloth and ashes? Wilt thou call this a fast, and a day acceptable to the Lord? Is not this rather the fast that I have chosen? Loose the bands of wickedness, undo the bundles that oppress, let them that are broken go free, and break asunder every burden. Deal thy bread to the hungry, and bring the harborless into thy house; when thou shalt see one naked, cover him, and despise not thy own flesh. Then shall thy light break forth as the morning and thy health shall speedily arise, and thy justice shall go before thy face, and the glory of the Lord shall gather thee up. Then shalt thou call, and the Lord shall hear: thou shalt cry, and He shall say: Here I am. Because I the Lord thy God am merciful. One thing I have asked of the Lord. this will I seek after: that I may dwell in the house of the Lord. V. That I may see the delight of the Lord, and be protected from His holy temple. O Lord, repay us not according to the sins we have committed, nor according to our iniquities. V. (Ps. 78: 8-9) O Lord, remember not our former iniquities: let Thy mercies speedily prevent us, for we are become exceeding poor. V. (Here all kneel down) Help Us, O Lord our Savior: and for the glory of Thy name, O Lord, deliver us: and forgive us our sins for Thy name’s sake. Quicken me, O Lord, according to Thy word: that I may know Thy testimonies. Grant, we pray Thee, O Lord, that the sacrifice of the Lenten observance, which we offer, may both render our souls acceptable and give us the power of a readier self-denial. Through our Lord Jesus Christ Thy Son. Who liveth and reigneth with Thee in the unity of the Holy Ghost, one God Forever and ever. R.Amen. O God, Who alone knowest the number of the elect to be admitted to the happiness of Heaven, grant, we beseech Thee, tht through the intercession of all Thy saints, the names of all who have been recommended to our prayers and of all the faithful, may be inscribed in the book of blessed predestination. Protect us, O Lord, who assist at Thy mysteries; that, fixed upon things divine we may serve Thee in both body and mind. Through our Lord Jesus Christ, Who livest and reignest, with God the Father, in the unity of the Holy Ghost, one God For ever and ever. R. Amen. Serve ye the Lord with fear: and rejoice unto Him with trembling. Embrace discipline, lest you perish from the just way. Having received the blessing of the heavenly gift, we beseech and supplicate Thee, O almighty God, that the same may be the cause both of the sacrament and of salvation. Through our Lord Jesus Christ, Who livest and reignest, with God the Father, in the unity of the Holy Ghost, one God For ever and ever. R. Amen. Watch over Thy people, O Lord, and of Thy clemency purge it of all its sins; for no adversity shall harm it, if no iniquity dominate it. Through our Lord Jesus Christ, Who livest and reignest, with God the Father, in the unity of the Holy Ghost, one God For ever and ever. R. Amen.